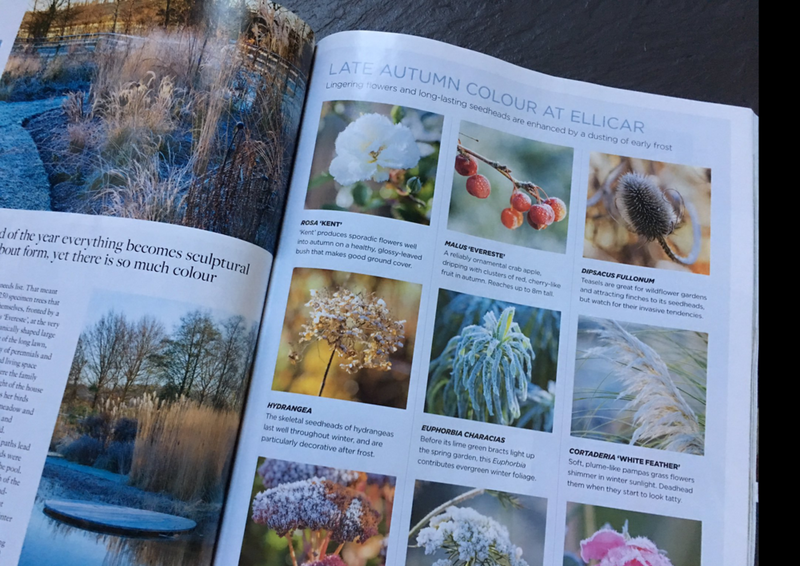 If you have enjoyed watching us on Gardeners World and would like to visit Ellicar Gardens in winter, we open for the NGS on 25th Feb, 12noon-4pm. Our winter garden in full blossom, with hellebores, snowdrops, fragrant shrubs, beautiful grasses and prairie borders, and our Natural Pool lies like a giant reflective Sky Mirror, at the heart of the garden. There is a lot to enjoy and explore here and it is great day out for bird watchers too. On Sunday 17th September 1-5pm, we are once again opening up our Ellicar Gardens and welcoming visitors to raise money for the National Garden Scheme charities. It is a great opportunity to explore our famous Natural Pool, with water lilies still in flower and its crystal clear water attracting swallows and unusual dragonflies. Lighting your pool and garden simply means you can enjoy it during the depths of winter - which is really uplifting on a dark winter’s evening. Lighting is an art form – too much of it and the place soon looks like Blackpool illuminations- to little and it can look gloomy. Ensata’s pool electrical and lighting specialist, Ian Schofield, works closely with our clients at design stage, creating both simple and effective lighting solutions to state of the art sound and light synchronized systems controlled by touch pads from the house. It is important that the cabling and trunking is in place during construction to future proof the design. is great for those late night swims on a balmy summer’s evening. These can be expensive and powerful (even colourful) flange lights which light up the entire swim zone- or a lower cost option is to install spotlights, which can be mounted on the pool wall, under decking. These softly light up the water, and create beautiful ripple patterns as you swim. We love lighting effects of moving water in the pool- for instance ripples from the inflow jets; up-lighting water fountains in millstones; boulder bubblers; back lighting water cascades; rills even up-lighting the bubbles that rise form the carbonators. Lighting effects on moving water creates a sensory experience and brings the water alive in the dark. Spotlights set in around the water’s edge, in decking or stone coping. These are a good idea if you enjoy late night gatherings beside the water- they highlight the water’s edge safely for people. Consider the activities you wish to enjoy outdoors- if you would like to sit and read beside the water, down lighters would be the answer- these can be mounted on pergolas, trees, garden buildings. If you need to light the way to your pool, lighting a path, light washing a wall, spots lights set in the borders may work well. These tiny pin-pricks of light, 2mm in diameter, sparkle in a star like effect around the pool - think fire flies in summer. Easiest applied in decking- where the 2mm diameter fibre optic cables are drilled through the surface of the deck and polished smooth. You really do not see these until they are switched on at night- the effect is quite magical. Our Ensata show pool has tiny fibre optic lights set into the penny deck surrounded by tall reeds. Fibre optics lights can be set on a ‘twinkle wheel’ where they literally sparkle, or a colour change option. The best lighting effects that allow you to enjoy your pool from further away are not actually in-pool lighting- rather up-lit garden features that are reflected to great effect in the water. Specimen trees up-lit or laced with fairy lights will magically be reflected in the water. Likewise buildings softly washed with light, statues up-lit, pergolas down-lit, create depth of field in the garden as well as illuminating your pool. One of our favourite lighting tricks is up lighting swathes of coloured cornus or red willows in winter in the borders beside the water- with soft white lighting, these literally glow like fireworks- and you get double the effect for your money as the borders are cast magically into the pool. 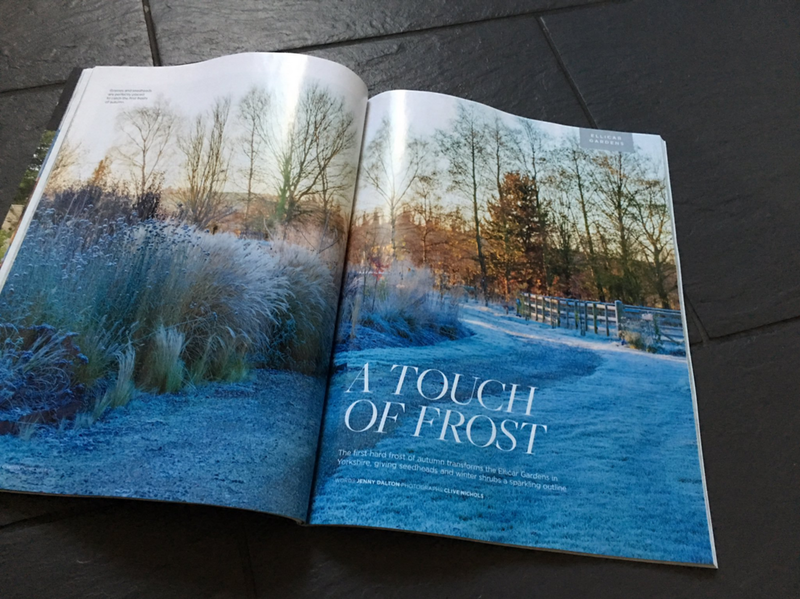 A fabulous multi-page feature showing the garden and natural pool in winter. Massive thanks to Clive Nichols Photography! We've recently been awarded Gold Standard in The UK Pool & Spa Awards 2016 for Residential Outdoor Pool of the Year. We were delighted to receive a Gold Standard in this year’s international UK Pool and Spa Awards. Facing tough competition from conventional pools around the world, our first ever Natural Pool project in Newark, clearly caught the judges' eye. Still one of our favourite projects, this 180m2 Natural Pool is really like a Spa Pool. Raised above the ground (due to high ground water conditions), this pool has attractive dry stone terraces, which soften the edges, integrating it into our client’s garden beautifully. The 12m x 4m swim zone is ideal for lengths and family fun. A gently sloping beach is the perfect place for our client’s young grandchildren to play, and helps to warm the water naturally. Paved steps leading down to a paved shallow end and stone coping on the internal walls also contribute to natural thermal gain. This pool warms up quickly in spring, without heating, and reaches 22C and 24C in summer. We were delighted to use our client’s own water lilies, which have been in her family for 100 years. They are simply stunning, flowering non- stop throughout the summer months. This medium sized pool is quick and easy to look after, and our client is so happy with it she has now installed a cabin behind the sun deck, so she can enjoy the water in winter, which also doubles as an excellent spare bedroom for her guests. Ellicar Gardens, near Doncaster, opens its garden gates to raise money for the National Garden Scheme charities on Sunday 18th September 1-5pm. The 5-acre family and wildlife gardens are full of late summer perennials and grasses, at their peak in September. The famous Natural Pool still has its water lilies in flower and its crystal clear water is attracting swallows and dragonflies. New areas of the gardens this year include a gravel beach around the pool, with alpines and carpeting thymes; a white border and a beautiful molinia avenue in flower now. There is plenty of fun for families, with children’s activities and the chance to explore Ellicar’s school garden, willow maze and creepie crawlie walk. Visitors can also say hello to the Murch’s menagerie of Rare Breed Pets, including the friendly Golden Guernsey Goat herd, native ponies, pigs and poultry. Other attractions include chatting to Yorkshire Dragon Fly Group, a local Bee Keeper, Lincolnshire Willow Weaver, Lincolnshire Cut Flower Grower, a Gardener’s Market with Plant Sales and a Garden Raffle. Delicious home made teas and refreshments are served all afternoon in the gardens by the 2nd Ranskill Scouts. Sheffield 13 Brass Ensemble will be entertaining visitors during the afternoon. Admission Adults £4.00 Children Free. All proceeds at the gate to support the NGS charities including Cancer UK, Macmillan, Hospice UK, Parkinsons. There is something compelling and uplifting about being beside water. Think of holidays beside the sea, walks along rivers and picnics on a lakeshore. Spending time beside the tranquil water of a Natural Pool is a sensory experience leaving you feeling calm and relaxed. It is also the perfect place to enjoy alfresco dining, a BBQ with the family, or just to sunbath and unwind with a book. Like most gardeners, I struggle to sit down and relax anywhere in my garden, there is always a weed to pull or a plant to tweak, but I do sit for pleasure beside our Natural Pool. My favorite place is out on the jetty, surrounded by crystal clear water, with a backdrop of birdsong and the soft hum of bumblebees working bright yellow flag irises nearby. Sumptuous water lilies float across the water’s surface. Now and then I catch the uplifting fragrance of water mint, growing in drifts around the pool edges. A gentle breeze rustles the reeds as water splashes energetically from a floating millstone, sending mesmerizing ripples down the pool, catching the sunlight. It is easy to sit here and gaze down into this giant aquarium, getting drawn in, watching a pair of dark newts drift lazily underwater or following the flight of an iridescent blue dragonfly as it zigzags across the water’s surface, with a low-pitched whirring of delicate, veined wings. In these 5 minutes of utter tranquility I could be anywhere in the world- but I’m sat in my own back garden, a short walk from the back door, beside our Natural Pool. Swimming in a Natural Pool is good for your health. With the rise in popularity of wild swimming, recent scientific surveys have shown swimming in fresh water to be beneficial for health, circulation and well being. The chemical free, pure living water in a Natural Pool leaves your hair silky, your skin soft, and does not sting your eyes. And there is no need to shower afterwards. Swimming in a Natural Pool releases endorphins, leaving you feeling fantastic. Most people who try swimming in a Natural Pool find it a completely different experience to conventional swimming. I’m addicted to an energizing morning swim and just can’t start the day without one now. A quick dip in the morning sets me up for the day, leaves me feeling invigorated, buzzing and ready to go. I’ll even race down to the pool and slip into the water at dawn if I have an early start. Early summer mornings swims with the pool still as glass and mist rising up from the water are quite ethereal. Evening swims are completely different - here the pool beckons and calls us to unwind after a busy day. Immersing yourself slowly into cool water, enjoying lazy lengths, or just floating on your back amongst the water lilies– it literally washes away the day’s troubles. Just being in the water, surrounded by beautiful water plants and wildlife gives you a wonderful sense of connection to nature. Like wild swimming in your own garden- you emerge feeling a different, better person. Deadlines, problems and life’s pressures are still there but somehow after a good swim they seem measurable. Less sublime, but equally fun is ‘The Family Swim’ – in our family this includes three boisterous teenagers, a competitive father, 4 dogs and various other pets all noisily trying to join in a huge riot in the water- at this point the haven of tranquility is rather shot to pieces but everyone has great fun. This happens most evenings just after the restorative swim. We have enjoyed our Natural Pool for 6 years now. We swim regularly for 8 months of the year and will occasionally jump in for a dare in the depths of winter. The pool has enriched our lives, brought incredible wildlife into the garden, and is simply a beautiful place that brings us together as a family and makes us all feel good. Registration and coffee at 09.30, DDD starts at 10.00 and finishing at 16.00. The basic principles of designing a Natural Pool. An insight into designing a user friendly natural pool site around the site specific and client requirements. Designing a Natural Pool for practical and easy maintenance and water management. Construction requirements and hard materials suitable for the pool finish and features. Planting in and around the pool, integrating the Natural Pool into the existing garden. Understanding realistic maintenance requirements for a Natural Pool. Preferred form of taking notes, camera. Swimming costume for anyone wanting to try out the Natural Pool. Please bring a packed lunch (tea, coffee and cakes will be provided). VAT Reg: 700 7292 64. Please note: No refund will be given for cancellations. Tickets cannot be transferred to other events. Full refunds will be given should the event have to be cancelled for any reason. No tickets will be sent out prior to this event. Or call the office on 01989 566 695 between 09:00 and 17:00 Monday to Friday with card details. We’re really excited to announce our new name: Ensata. Ensata is a species of asiatic Iris, and widely cultivated as an ornamental plant. We’ve chosen the Iris as our logo to represent our approach to the pool-spaces we create for our clients - personal expressions of an outdoor life, in-tune with nature, completely bespoke, utilising the best filtration technology available. We are delighted to see so much frog spawn this year which could be from 4th generation frogs as our pool is now six years old.